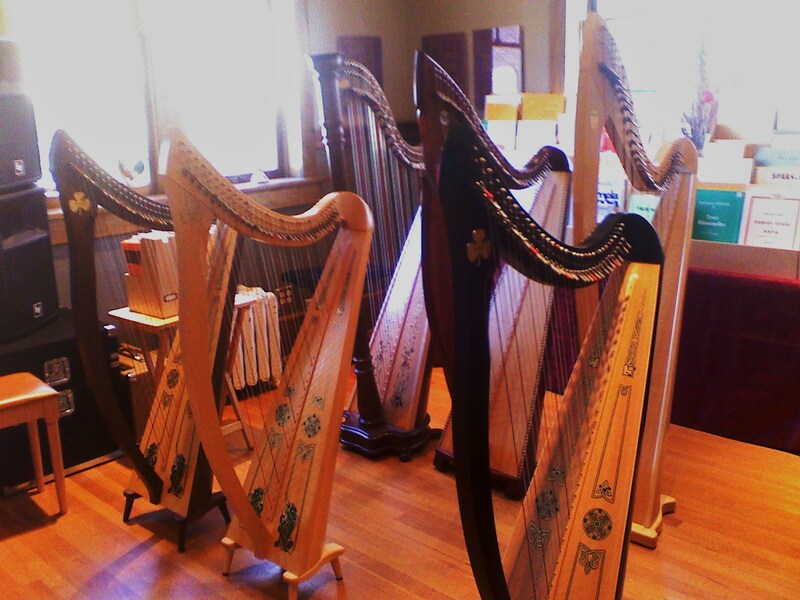 Have you ever felt like your harp just doesn’t resonate like it used to? Let’s talk about bass wires and the sonic contributions they make over the harp’s entire range. What are bass wires and why should you care about them? They are the metal strings in the lowest two octaves on your harp. 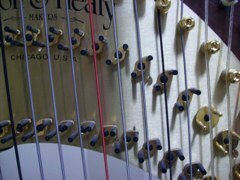 On a typical pedal harp, the bass wires run from the lowest string up through 5th octave G. On some lever harps, the wires run as high as 5th octave C.
Each bass string consists of two pieces of wire. A plain steel core runs straight up from end to end. A much thinner winding coils around the core, and this is the part of the wire that you can see. Between the core and the winding a layer of silk threads keeps the core and winding from vibrating against one another. A good set of wires will resonate sympathetically even when you’re playing strings in higher registers,resulting in a richer sound and better projection across the harp’s entire range. You can demonstrate this by playing a chord in the second or third octave, then quickly dampening the strings you just played. Do you still hear the chord? That’s the sound of the lower strings vibrating in sympathy with the higher ones. 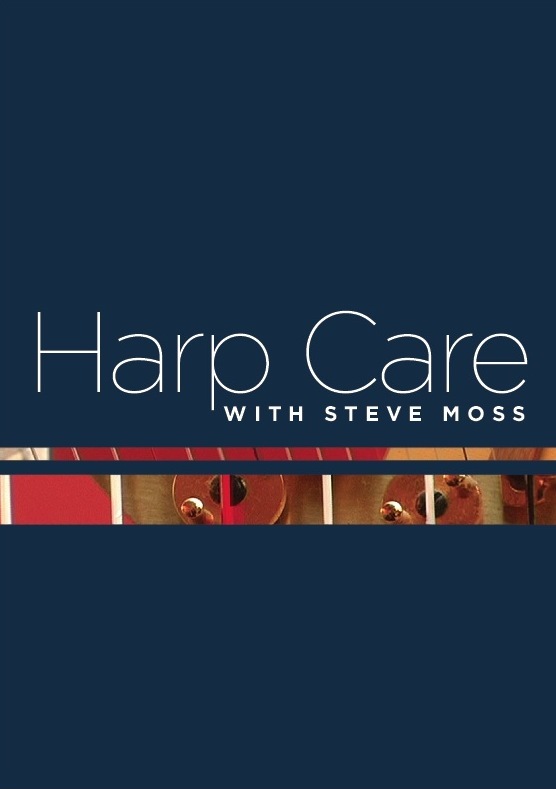 The bass wires act as assistants in the harp’s resonance, even when they aren’t being played. Over time, dust and grime work their way in between the coils of the winding, muffling the wire’s sound and dampening its sustain. Old bass wires have a tubby, plunky sound that dies quickly, while new ones ring out and hold their tone longer. Eventually, the tight winding of the coil begins to loosen and the wires begin to rattle or sizzle loudly. As wires age, their ability to vibrate sympathetically decreases. Tarnish on the coil’s surface will cause it to lose its resonance. This happens slowly so that you may not notice the effect, but you may wonder why your harp just doesn’t sound as good as it used to. How often should you replace your wires? That depends on your playing level and your needs. Many orchestra players I know replace their bass wires once a year. They need every bit of sound the harp can produce to compete with the other instruments onstage. I would recommend that anyone who plays in public on a regular basis change their bass wires every two years. More casual players can wait longer, perhaps as many as five years. If you haven’t replaced your bass wires in a long time, try it, and you’ll be pleased with the instant improvement in your harp’s tone.